Have you ever stood at a deli counter watching other people get served first, even though you were next in line? Unfortunately, this is a common problem that customers at dine in cinemas face all the time but can be easily solved. During the busiest, most chaotic time before a movie starts and the first 30 minutes into the feature, your service staff is more focused on just getting to the first call button they see rather than servicing customers in order of wait time. With the Venue Valet Service Queue Screen, there will be no confusion as to which customer should be served next. These dedicated monitors are installed high on the back wall, visible to your staff from anywhere in the auditorium. They are easy to read and get to the point. 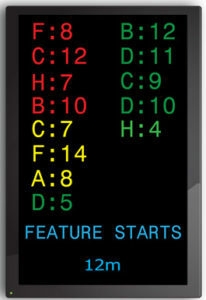 Unlike our regular CallConnect monitors which display a great deal of information, these screens only display the active seat number, color coded to match their wait time, plus other service critical information such as a countdown timer displaying when the feature starts and ends and other service alerts such as “Drop Checks Now”.